The exchange-traded funds for the Dow and four other averages have negative weekly charts on Friday’s stock rout. Is the bear finally here? A week ago the weekly charts were flashing technical warnings despite the high probability that he U.K. would vote to stay in the European Union. Even with the Dow Jones Industrial Average (INDU closing above 18,000 on Thursday and with the S&P 500 within 1% of its all-time high, weekly momentum (12x3x3 weekly slow stochastics) continued to decline. This technical setup was a clear warning that stocks would be vulnerable given a vote by the U.K. to leave the European Union. 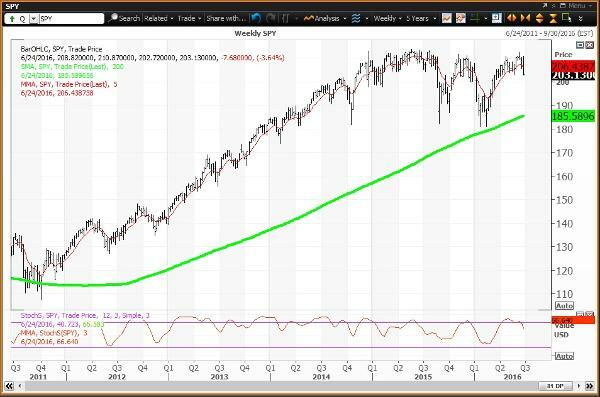 The weekly charts are now negative for all five major U.S. equity averages, which is a clear signal that 2016 would be "the year of the bear." All five now have year-to-date losses. The Dow 30 is down just 0.1% with the S&P 500 down just 0.3%. 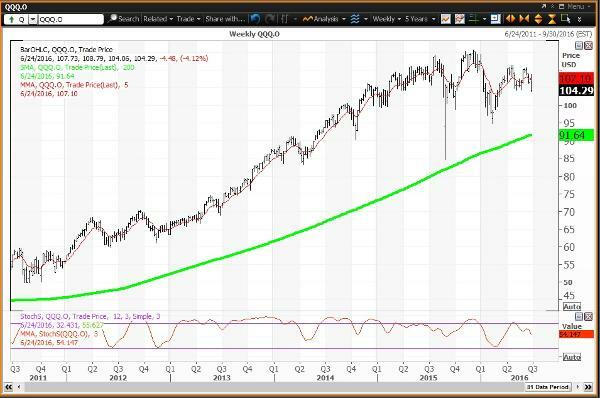 The Nasdaq Composite NDAQ is down 6% year to date, with transports down 2.5% and the Russell 2000 down 0.7%. The Nasdaq and Russell 2000 ended the week in correction territory with declines off their all-time highs of 10% and 13%, respectively. Transports have fallen into bear market territory 21.4% off its all-time high. Here's how to trade the five major U.S. equity averages via the exchange-traded funds that track them. The Dow Jones Industrial Average can be traded using the SPDR Dow Jones Industrial Average ETF (DIA , aka Diamonds. The S&P 500 can be traded using the SPDR S&P 500 ETF Trust (SPY , aka Spiders. The Nasdaq is best traded using the ETF that represents the Nasdaq 100, the PowerShares QQQ Trust ETF (QQQ , dubbed QQQs. The Dow Jones Transportation Average can be traded using the iShares Transportation Average ETF (IYT . 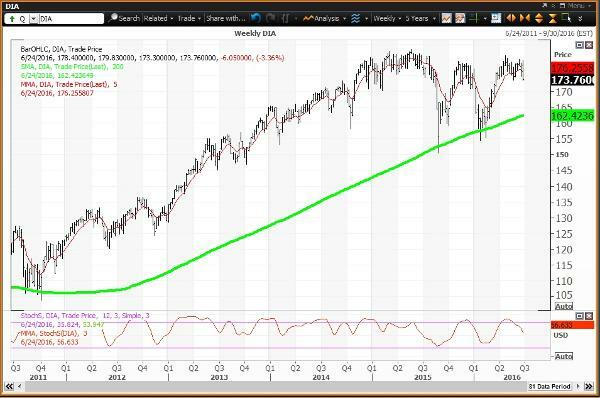 The Russell 2000 can be traded using the iShares Russell 2000 ETF (IWM . Here are the daily charts and trading levels for the five stock market ETFs. The weekly chart for Diamonds stays negative with the ETF below its key weekly moving average of $176.26 and still well above its 200-week simple moving average of $162.42. The weekly momentum reading ended last week at 56.63 down from 67.04 on June 17. 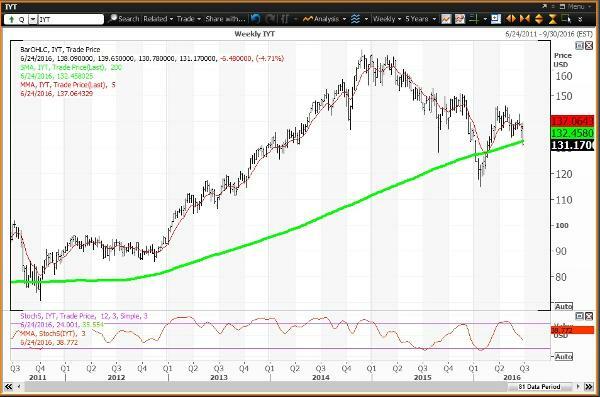 Investors looking to buy this ETF should hold off as the downside risk is to $145.45 by the end of 2016. Investors looking to reduce holdings should do so on strength to $174.99, which is a key levels on technical charts until the end of this week. The weekly chart for Spiders remains negative with the ETF below its key weekly moving average of $206.44 and still well above its 200-week simple moving average of $185.59. The weekly momentum reading ended last week at 66.64 down from 79.60 on June 17. Investors looking to by Spiders should hold off as the downside risk is to $163.38 by the end of 2016. Investors looking to reduce holdings should do so on strength to 206.91, which is a key level on technical charts until the end of this week. The weekly chart for QQQ remains negative with the ETF below its key weekly moving average of $107.10 and still well above its 200-week simple moving average of $91.64. The weekly momentum reading declined to 54.15 down from 65.01 on June 17. Investors looking to buy QQQ should hold off as the downside risk is to $96.72, which is a key level for the remainder of 2016. Investors looking to reduce holdings should do so on strength to $206.91, which is a key level on technical charts until the end of this week. 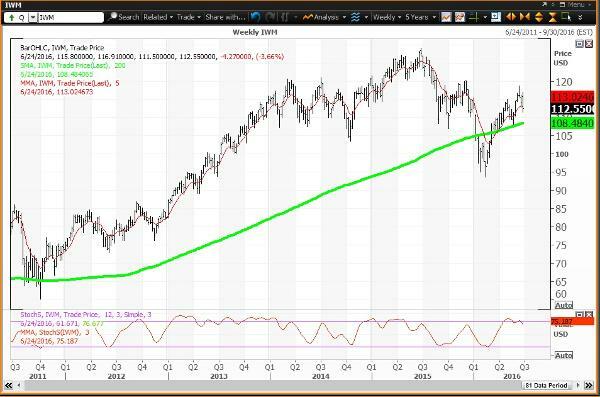 The weekly chart for the transportation ETF stays negative with the ETF below its key weekly moving average of $137/06 and just below its 200-week simple moving average of $132.46. The weekly momentum reading ended last week at 38.77 down from 46.16 on June 17. Investors looking to buy the transportation ETF should consider doing so on weakness to $123.82, which is the downside risk until the end of 2016. Investors looking to reduce holdings should do so on strength to 136.24, which is a key level on technical charts until the end of 2016. The weekly chart for the small-cap ETF has been downgraded to negative from positive but overbought with the ETF just below its key weekly moving average of $113.02 and above its 200-week simple moving average of $108.48. The weekly momentum reading ended last week at 75.19 down from 81.95 on June 17 moving below the overbought threshold of 80.00. Investors looking to buy this ETF should do so on weakness to $103.68, which is a key level on technical charts until the end of 2016. Investors looking to reduce holdings should do so on strength to $115.49, which is a key level on technical charts until the end of this week.